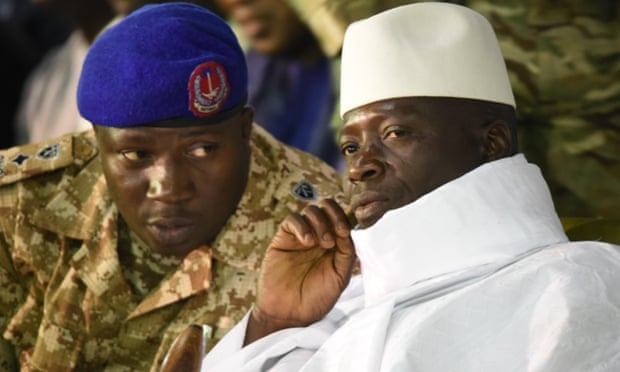 Yahya Jammeh, the former president of the Gambia, orchestrated the theft of almost $1bn (£760m) from his country before his flight into exile two years ago, investigative reporters have alleged, the Guardian reports. Jammeh, a former military officer who seized power in a coup in 1994, fled into exile in early 2017 after losing an election. In December 2017, the Trump administration placed Jammeh under US sanctions for his “long history of engaging in serious human rights abuses and corruption”, including a torture and assassination squad called the Junglers that targeted Jammeh’s critics and political opponents. The following year the state department announced that Jammeh and his family were barred from the United States. Jeggan Grey-Johnson, a communications officer at the African office of the Open Society Foundation, told the OCCRP that Jammeh “ran the country like an organised crime syndicate”, but said his abuses had been largely ignored by the international community because of the small size of the west African state. At the time it originally placed him under sanctions, the US treasury also accused Jammeh of having “directed the unlawful withdrawal” of at least $50m from his own country. - $71m diverted from the Central Bank of the Gambia in a matter of years, principally from a consolidated revenue fund intended to hold government receipts, including income taxes. - 82% of revenues from the state telecoms operator, totalling about $364m, which were paid out in contracts with various third parties or withdrawn by associates of Jammeh’s in cash. - $36,000 diverted into an account set up for “the Office of the First Lady”, despite no such office existing. - Multiple requests by Jammeh associates for withdrawals from the revenues of a 10% levy on fish catches in Gambian waters. - Some of the funds were spent on luxuries for Jammeh, including a palace with a private mosque, or invested in high-profile prestige projects, such as a tribute concert to Michael Jackson in 2010 after the singer’s death. Documents showed that over two years, at least $35m had been extracted from an account referred to as “3M” at the US financial services firm Citibank, set up to receive aid from Taiwan, the OCCRP said. Citibank declined to comment. The money was reportedly distributed to about 20 beneficiaries. Among them was Muhammad Bazzi, a businessman and alleged financier of the Lebanese terrorist group Hezbollah. Last year Bazzi was placed under US sanctions over his alleged ties to the group, together with five companies under his control. The US treasury described him as a “close associate” of Jammeh, and accused him of links to drug trafficking and money laundering. The OCCRP said Bazzi had not responded to requests for comment. Survivors of Jammeh’s 22 years of power describe his rule over the state as defined by cruelty and eccentricity. Last year 12 bodies were exhumed from a mass grave outside the capital, Banjul, believed to be victims of a massacre by the Junglers. A former military officer, Jammeh also claimed to have invented a cure for HIV, and forced multiple HIV-positive Gambians to submit as test subjects for potions of his own design. A truth, reconciliation and reparations committee estimated last year that 150,000 victims of the Jammeh regime were waiting to tell their stories. However, in December 2016 Jammeh lost an election to a rival candidate, Adama Barrow, and was called on to step down. He initially conceded but later changed his mind and rejected the result, alleging “serious and unacceptable abnormalities” in the process. After a month-long standoff and under pressure from other west African heads of state, Jammeh eventually conceded and left the country. He was accompanied by a cargo plane stuffed with luxuries, including at least three cars, according to the New York Times. A commission of inquiry into economic crimes committed under Jammeh, who lives in exile in Equatorial Guinea, is yet to report. The OCCRP said the Equatoguinean government had not responded to requests to reach Jammeh for comment.